So LFW is upon us once again -- and this time celebrate its 25th anniversary! Last time it was 'that time of year', ie, the autumn 2008 there was a measure of uncertainty in the air. The economy wasn't looking great, mighty banks rumbled at their foundations and retail looked headed for slower times. Buyers dithered over order sheets in the tents at the Natural History Museum. That was then. Now many mighty banks have simply crashed, the economy is into one of the worst recessions ever, retail has not just slowed, in pockets its simply stopped and buyers, well, many of them don't have jobs at all. What a difference 5 months can make. 1) cavalier, 'i-need-a-new-trend-a-week' spending has declined. GOOD. Now those of us who have been banging on about buying seasonless, trend-neutral but high quality clothing, are likely to gain a more sympathetic audience. More important, the joy of shopping for, possession of and caring for one's wardrobe can be experienced (for some 20 year olds, this might be a first). In itself such a change will have a wonderfully healthy effect on one of ethically sound fashion's goals, ie, slowing things down (you just have to do some minimal googling on the disasterous effects of fast fashion, to understand why this is such a key goal...start here if you like). 2) high quality design and designers will get a more air-time. GOOD. As people become more concerned about spending intelligently they will seek out more than just what the latest glossy touts as a must-have. Part of the new wave, I predict, will be designers who have in some way, built in green/ethical/eco responsibility into their collections. Quality is likely to be associated more than ever with the entire product rather than just its media stickiness. And independant, responsible, talented designers, who would have otherwise been lost among those that had the financial muscle to flood the space with great PR, glamourous lookbooks and celebrity backing, will get a fair chance to shine. 3) the love of adorning oneself, the thrill of shopping for something beautiful and the general joys of fashion won't go away, rather, the focus will shift. GOOD. Accessories and staples (jeans, the perfect white shirt) with a creative twist, a special something, will get more attention. These are items with many lives and with great CPW - they will work hard for what they are worth and justify their presence in your closet. Also styling will become more than just a buzzword among fashionable types and/or a way to describe some people's entire career (the 'stylist industry', btw, I predict will be a big area of lay-offs). Style will become about knowing what works on you, digging deep in your wardrobe for pieces that become you and putting your look together based on this knowledge. It will move away from looking like what fashion editors tell you you ought to look like. All this makes me look forward, more than ever, to London Fashion Week. As has been pointed out in the mainstream and online press, it may not have the money or glitz of nyc or milan, but London has the talent and the edge. I would like to add that, as Estethica's growing success shows, London Fashion Week also has the conscience to suit these times than perhaps any other of its competitors. There are some exciting new names at Estethica this year including Ada Zanditon, Butcher Couture Eyewear, M.I.A. (winner of 2008's Make Your Mark in Fashion, which DeviDoll was proud to sponsor) and Numanu plus those we know but whom never fail to surprise and delight, such as From Somewhere, Beyond Skin (launching a new logo and look this season) and Anatomy. 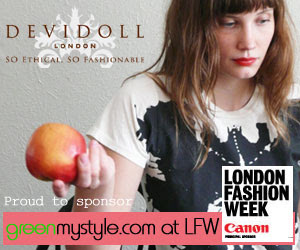 DeviDoll is proud to sponsor LFW on greenmystyle because we're proud to be part of the thinking and innovation behind what is truly, genuinely and rightly, fashionable. SUMMER RAYNE OAKES' STYLE, NATURALLY IS OUT!